One of the things I like about blogging is the wealth of information that is being exchanged. Now and then, someone leaves a comment on my blog that leads me to discover something new or interesting. This was how I came to learn of Stefan Zweig’s The World of Yesterday. Andrew – writing All Downhill from Here over in Hong Kong – had recommended it in response to a review on Zweig’s Letter from an Unknown Woman that I had posted here. I added The World of Yesterday to my list of books to read, but it would have to wait as I had a growing pile of novels stacked over the fireplace. Some months later, I was reminded of the book by Richard, whose photo blog is called if you see light, who mentioned he had bought a copy after reading about Stefan Zweig on my blog. So that was how I ended up ordering The World of Yesterday! It took me several months before I started reading it as I didn’t feel up to it. A large part of The World of Yesterday revolves around the years of the Great War and the Second World War – I wasn’t sure if it would be too depressing for a grey, wet winter in Brussels. Then I read Maxim Leo’s Red Love: The Story of an East German Family, which I enjoyed tremendously. Set in the former German Democratic Republic, this family memoir somehow set the stage for The World of Yesterday. So I travelled further back in time – starting with the Zweig’s childhood and youth during the final years of the Habsburg Empire. It was interesting to read about his privileged upbringing, being Jewish and what it meant (and probably is still the case) to have a profound love for culture, the mark of a true Viennese. Having visited Vienna for the first time last December, it was nice to be able to visualise some of the places that he described in his autobiography. 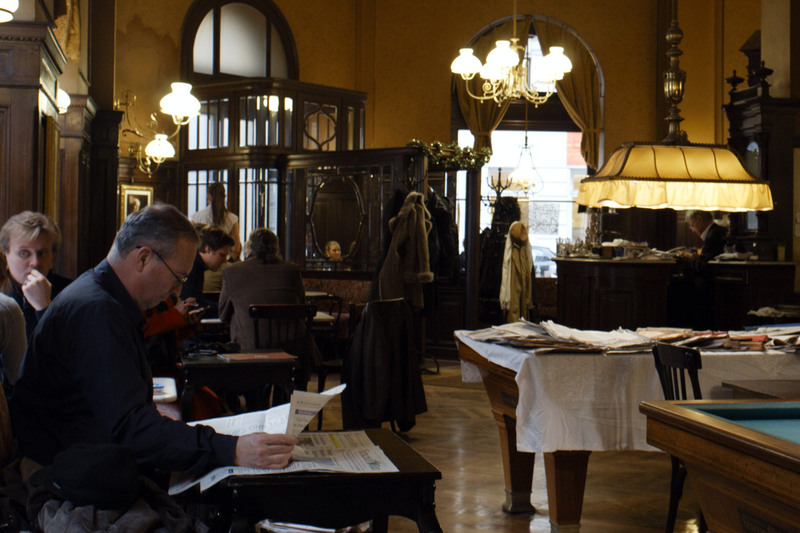 For instance, Zweig’s description of browsing the international newspapers in the coffee houses struck a chord. The World of Yesterday is like a history book of the golden years in Central Europe before the First World War, the horrors of the Great War and the one that followed it, and relatively peaceful and progressive time between the two wars. The World of Yesterday traces Zweig’s career, including his rise to becoming the most widely translated author of his time in the 1930s. It also includes anecdotes of encounters and friendships with writers such as James Joyce, Hugo von Hofmannsthal and Romain Rolland, as well as politicians and musicians including Maxim Gorky, Walther Rathenau and Richard Strauss. In February 1942, Zweig posted the manuscript for The World of Yesterday to his publisher the day before he committed suicide together with his second wife in Petrópolis, Brazil. Previous articleAround the WorldHave you been to Paris, Texas? Follow my blog please? I do reviews on rock and roll autobiographies…. Thank you for your insight into this book that I know I will not read but I will remember. Agree, the blogging world is a wealth of information and I love the exchange of ideas too. Learnt something new from your post today! Thanks for sharing! Thanks for passing the baton ! I’ll track it down. Regards Thom. I am pleased and relieved that you enjoyed it. Thanks for the link. Blogs often make me realize how much I don’t know–which is a great thing. I enjoyed your thoughtful review but what a chilling ending to Zweig.